Robert Soler has the perfect name for his career — the ex-NASA scientist is an expert in sunlight. Specifically, Soler studies how sunlight affects humans. 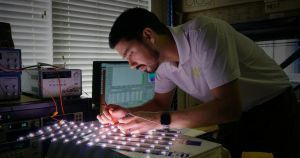 He helped design the lighting system on the International Space Station so that astronauts wouldn’t suffer from a lack of light while on missions. Now he’s one of the founders of BIOS Lighting, a startup creating lights that could potentially help humans avoid a host of health problems. Sunlight plays an important role in managing humans’ circadian rhythms, the internal clocks that let our bodies know when it’s time for certain activities. When our eyes detect daylight, for example, they signal to our body that it’s time to be awake, and vice versa. But spending significant time indoors, under artificial lights, can screw up our circadian rhythms. As Soler told The San Diego Union-Tribune, humans now live in a “constant twilight that’s neither day nor night,” and researchers have linked this new relationship with light to a slew of health problems, from depression to diabetes. To help, BIOS has developed artificial lights that it claims more closely mimic the light of the Sun by including a part of the spectrum known as “sky blue frequency.” This light signals to our eyes that it’s daytime, but other companies don’t include the frequency in their lights for a straightforward reason: it adds a blue tint to the light that looks weird. BIOS claims it’s created an LED light that includes the sky blue frequency but without the odd blue glow. It’s already selling the lights to schools and offices, according to the Union-Tribune, and within the next few months it’ll begin selling a consumer line in a variety of styles — giving anyone the opportunity to potentially better their health with the flip of a switch.